Elizabeth has worked as a HarvestPlus cassava breeder at IITA, Ibadan, Nigeria since 2012, after spending 20 years with Ghana’s CSIR-Crops Research Institute. Working in collaboration with partners across Africa, Elizabeth develops cassava varieties with high levels of provitamin A in the storage roots, and she supports delivery activities to over 750,000 households in Nigeria. She obtained her PhD in Plant Breeding from the University of the Free State, South Africa; her MPhil. 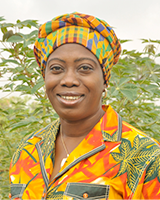 in Crop Science from the University of Ghana; and her BSc. in Agriculture and Diploma in Education from the University of Cape Coast, Ghana. Her passion is for working with end users, particularly women farmers, the youth and young women scientists – a perspective that she will bring to this GREAT Course as she shares her experiences and lessons learnt in participatory breeding with gender responsiveness.